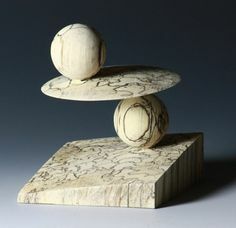 Mike Wilkinson creates artful cutting boards by cutting different kinds of wood in curved designs. At the end of last year I shared the picture of the cutting board shown here and said one of my goals for 2015 is to find out how you can make curved pieces of wood fit perfectly together with a smooth finished surface. Last week Mike Wilkinson, who made the cutting board in the picture, graciously helped me meet that goal by showing me all the steps at his home workshop in Fort Collins. Mike begins by drawing a design on a board about ¾-inch thick and longer and wider than the cutting board will be. Marking a number on each shape to represent its order in the design prevents confusion later. 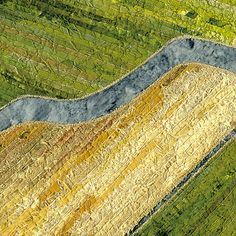 He slowly guides the marked wood through his band saw along his pencil lines, much like I guide fabric through my sewing machine. The newly cut pieces of wood become the pattern he will draw on maple, cherry, and walnut boards. 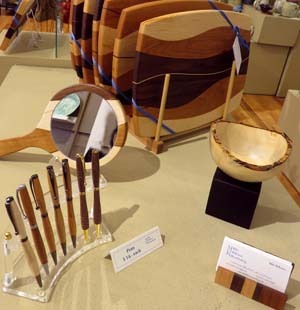 Wood pattern pieces for multicolored cutting boards lie ready at Mike Wilkinson’s workshop. 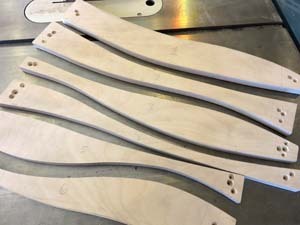 The pilot holes that Mike drilled at each end of the wood pattern pieces in the picture are farther apart than the length of a finished cutting board. They’re needed in an upcoming step. On top of a fresh board of maple, Mike lays the piece numbered “1” and draws along its curved edge. Then he takes piece number “2” and sets it about 1/8 inch from the line he just drew and draws a line along both sides. He continues the process until he has all six parts of his design divided by two lines 1/8 inch apart. He returns to the band saw and cuts the maple between the double lines. 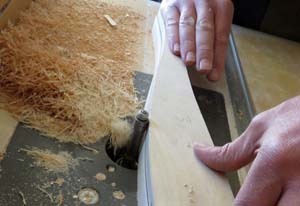 Mike Wilkinson passes a curved piece of maple along a router to cut it perfectly to the size of the wood pattern on top. At this point each piece of maple that he cuts is slightly larger than its corresponding pattern piece. Mike screws the pattern piece onto the piece of maple and turns on his router. Spiraling around the metal post of the router, the blade shaves off excess wood as Mike passes the maple by it several times. A special bearing on top of the router runs along the edge of the pattern and keeps the blade below it from cutting too deep into the maple. When the maple is exactly the size of the pattern, he removes the screws that held the two pieces together. The holes in the maple will be removed later when he cuts the perimeter of the cutting board. After all six pieces of maple have been through this shaping process, Mike repeats the whole process on pieces of cherry and walnut using the same wood pattern. 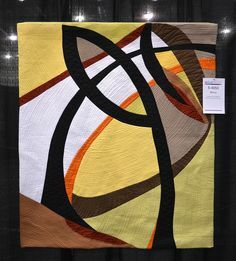 Then he can experiment with patterns of color, combining pattern pieces from different woods to incorporate orange, dark brown, and beige into the completed design. With six pieces to the pattern and three colors of wood, 96 unique combinations are possible. 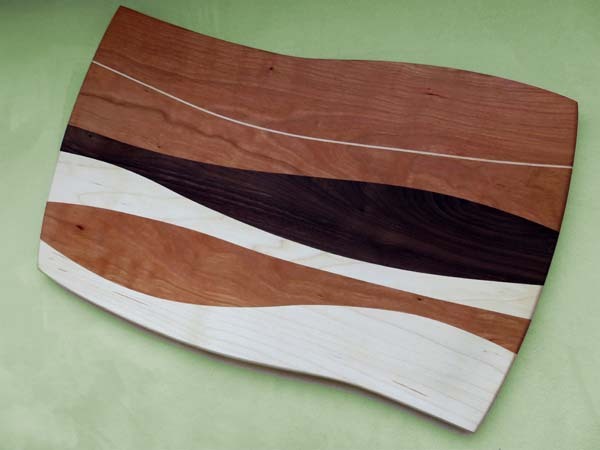 Mike Wilkinson uses Titebond waterproof glue to assemble his multi-colored cutting boards. 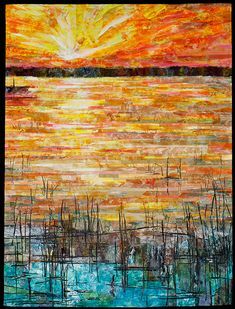 Once he decides on a combination, he sets the pieces on edge and applies Titebond waterproof glue in even waves. 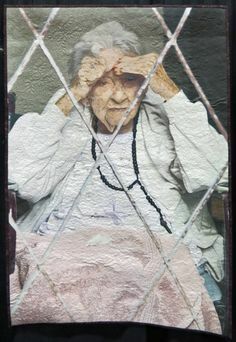 In the upper left corner of the picture is a straight, thin piece of cherry – the only piece there that is glued on its surface instead of its edge. Mike kindly added it as the seventh piece in his design to satisfy my curiosity about the very thin curved pieces he often includes. 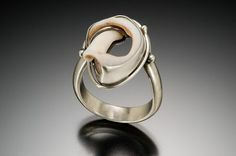 When set on edge and pressed between two larger curved shapes, a piece of maple or cherry just 1/16th of an inch thick bends and follows the curves of the wood on either side. You can see the result on the finished boards in the first picture and last pictures in this post. Mike Wilkinson tightens heavy-duty clamps to hold multiple pieces of wood together for his functional wood craft. 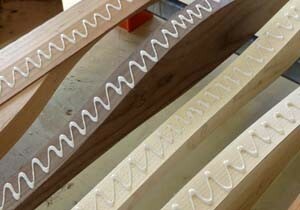 Hefty clamps hold all the pieces tightly together for 24 hours until the glue dries. Glue seeps up between the pieces, and the boards are not perfectly in the same plane with each other. That’s especially true of the thin piece of cherry, which protrudes well above the surface. At the end of the drying period, Mike runs the board through his electric planer. The knife in the planer slices off the top of the board, one thin slice at a time, until the glue is gone and all the pieces of wood feel like one board. Mike cuts the final shape and rounds the edges of the board slightly with a new bit on the router. Finally he sands the board with 120 sandpaper and applies mineral oil. 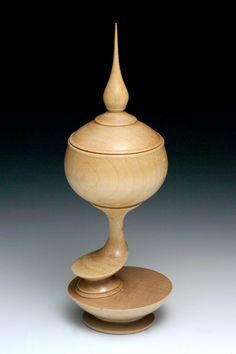 Safe for contact with food, mineral oil protects the wood from drying out and makes the color of the wood pop. Several of Mike’s boards and other functional items are for sale at Trimble Court Artisans off of Old Town Square in Fort Collins. Small items aren’t all that Mike makes, however. The day I visited his studio, a large dresser sat to one side, waiting for its drawer fronts. Mike had made it according to a customer’s specifications, right down to the natural maple finish. Mike was a full-time pilot for United Airlines when the Twin Towers fell in 2001. Laid off before the year was over, he turned his woodworking hobby into a job. He designed and built office furnishings, closet systems, and cabinets of all sorts, including what an entire kitchen would need. In 2006, United Airlines hired him full-time once again. He flew for two years before the economy crashed and he was laid off again. As before, he turned to woodworking, doing business as Mike Wilkinson Woodworking. Looking back at that time, he appreciates that he had more time with his sons, including the luxury of being their soccer coach. 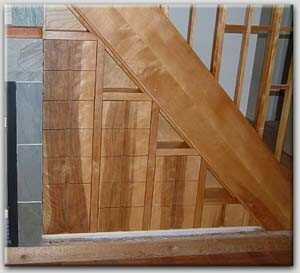 You can browse through Mike’s work at www.MWWoodworking.com. A project that is one of my favorites is under-the-stairs storage in the form of columns of drawers. Today he is a full-time pilot again for United and has been for over a year. 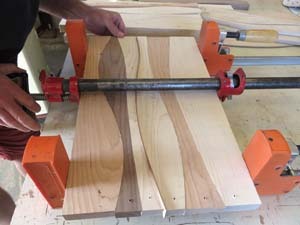 Mike no longer accepts large woodworking jobs with timelines, but he does make furniture and other items that don’t require quick production or tightly scheduled installation. If you would like to inquire about a project, you can find contact information on the header of his website or pick up one of his business cards at Trimble Court. This entry was posted in Wood and tagged cutting boards, woodworking on April 1, 2015 by Sally.